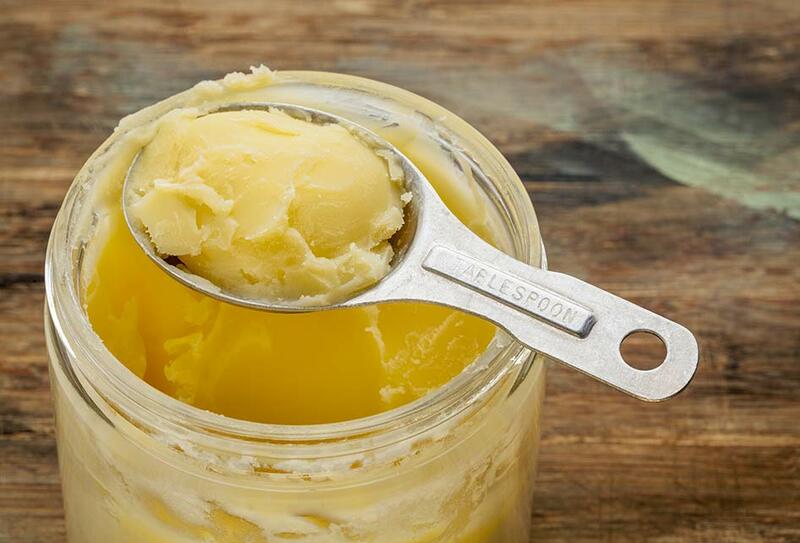 ﻿ Eat Butter to Protect Your Brain | Christiane Northrup, M.D. What is your biggest concern when it comes to your long-term health?If I asked 100 of my subscribers I bet the majority of you would respond by answering: dementia and Alzheimer’s disease. As of today, there is no treatment for either of these conditions…or is there? Dr. David Perlmutter, a board certified neurologist and author of Grain Brain: The Surprising Truth about Wheat, Carbs, and Sugar—Your Brain’s Silent Killers, has discovered exactly what the title of his book suggests. Gluten, carbs, and sugar can affect your brain’s health. It’s only been a few years since the recommendation was 6-11 servings per day. Now, after many years of following these guidelines, the number of Americans with obesity, diabetes, dementia, depression, and Alzheimer’s Disease has reached epic proportions. That’s because what you eat matters—particularly when it comes to brain health. When you eat foods with gluten and sugar-laden carbs, it causes your blood sugar to rise. And when your blood sugar levels rise, not only can it cause systemic inflammation, it can also lead to deterioration of the blood brain barrier. This protective covering keeps toxins, bacteria, and other foreign substances from affecting your brain’s health. So, you want to do what you can to protect the blood brain barrier. Once the blood brain barrier is damaged, the brain is susceptible to unhealthy substances. And this also can lead to inflammation. When the brain is inflamed, it shrinks—and this can cause neurological problems, like memory loss and movement disorders. When it comes to inflammation, the brain is not like other parts of the body. If you pull a muscle in your arm, you will most likely experience pain and swelling. These are signals that tell you to rest your arm until the swelling goes down and it feels better. Unlike your arm, the brain has no pain sensors, meaning there is nothing to indicate that the brain is inflamed. While there are no approved treatments for dementia or Alzheimer’s disease, there is something you can do! Dr. Perlmutter knows this first hand. He has put many patients on a gluten-free, low-carb and low-sugar diets with remarkable results. When you were little you were probably told that fish was brain food. This healthy fat is definitely good for your brain. And so are some saturated fats! Yes, avocados, coconut oil, grass-fed beef, wild fish, butter, and cheese are good foods for the brain, too. Dr. Permutter reminds us that we need saturated fats and that we’ve been eating saturated fats for years. Even human breast milk is 50% saturated fat! And the brain is comprised of 60% fat. Doctors and scientists have now confirmed that you can rebuild your brain, simply by eating these healthy fats. Saturated fats found in butter, beef, and cheese have been made out to be the enemy for about 30 years. And back when people were told to consume 6-11 servings of carbs per day, they were also advised to ingest fat very sparingly. Again, this advice has shown to be unhealthy for your brain. While you add back the butter, also keep your carb intake low—and that means all carbs, even healthy whole grains, vegetables, and fruits. The idea is to eat low-glycemic foods, and to make sure that, all combined, you aren’t eating foods that cause a lot of sugar to circulate in your bloodstream. Even though fruit and brown rice are healthy choices, even these foods will affect your blood sugar if eaten in excess. Were you surprised to hear butter is good for your brain? What do you do to promote brain health? Please leave me a comment. I love to read your suggestions. Yes I too love winter. You never have to feel guilty about taking the snow day off! Cuddle up with your honey and binge watch. Warmer weather entails so much work! Gardening and such. Plus the heat of warmer seasons, I can do without.. The kitchen is too hot to spend any time there! My weight is to low. I added grass butter. Then medical medium pointed out a lot of us are eating to much animal fat. That it makes jelly mucous, which I have. I feel good when I don’t eat ( grass ) animal, but I loose more weight. Does anyone have ideas for balancing all of this? Try whole coconut if you can. If you juice coconut meat, then mix the pulp, juice extracted, and coconut water back together, it makes an amazing, creamy delight! You could also try ghee, which is a traditional clarified butter from India. Dr. Permutter reminds us that we need saturated fats and that we’ve been eating saturated fats for years. Even human breast milk is 50% saturated fat! And the brain is comprised of 60% fat. Doctors and scientists have now confirmed that you can rebuild your brain, simply by eating these healthy fats. Saturated fats found in butter, beef, and cheese have been made out to be the enemy for about 30 years. And back when people were told to consume 6-11 servings of carbs per day, they were also advised to ingest fat very sparingly. plz explains these lines ,my english is week thanks any one? Neurological Associates of Albany and Alzheimer’s Doctor Richard F. Holub offers Alzheimer’s Research, Clinical Trials and Memory Disorder Treatment in Albany. Dr. Northrup we had the pleasure to see you speak at a Hay House event and love your information. Keep up the Great work. You are an inspiration to women everywhere. Corn flour is good or not? what about corn and corn flour? My mother has Alzheimer’s and it seems very clear that this was the result of years of unhealthy diet and lifestyle choices – along with a decade of Lipitor. Thank you for all you are doing to educate and inspire us to make choices for a full, happy, and healthy life. You’re my hero! As someone who worked for the Pritikin Program, it is refreshing to see attitudes change. When we get stuck in a tunnel vision of thought, we rob ourselves of knowledge. Give me healthy fat or give me death! It’s amazing how the body has the wisdom to know that healthy fat is what it needs. Great confirmation is provided in this blog. By the way, you win the most unique blog title award. is ghee good like butter? Thanks for all these great comments. Since every individual is different, it is not possible to give specifics on, for example, how much fruit is too much. For some, a 1/2 cup of berries is all they can handle. For others, unlimited. Bottom line: when the food is whole and organic, you don’t need to be real specific. The body is naturally satisfied! I’m using coconut oil and olive oil only. I discovered goat cheese, it’s delicious!And I’ve been using whole eggs for several years and telling everyone I know to eat the whole thing! Also avacodos. Thanks. Doing it all the way and feeling great, Dr. Northrup. Great work. Thanks for publicizing it. Martine. The information shared in this article contradicts 30+ years of research in Whole Food Plant Based nutrition. Eliminating ALL animal proteins and ALL oil has been proven to reverse and/or prevent chronic degenerative diseases. The documentary “Forks over Knives” recaps research by well known doctors and bio-chemist. Watch and make your own decision. The data is easy to understand and pretty clear what the solution should be. What is considered too much fruit in the diet? Currently, I consume about 3-4 and sometimes 5 servings a day. Good food for thought, Dr. Northrup. However, hearing phrases like “not in excess”, “limit”, etc. from the medical and scientific community is maddening. If you’re going to inform us, please be specific. Otherwise, it’s “blah, blah, blah” and not useful for application. Would love to hear SOME SPECIFICS. THANKS. Thank you. I always use butter because I have believed for years that margarine and fake butters weren’t healthy. I appreciate your wonderful insight. Please keep sharing your wonderful insight and I will pass it along. Thank you so much for the insightful and well-researched things you post and share. It is so nice to read these things from a physician I trust who is also open to alternative and holistic modalities. I read parts of the Wisdom of Menopause and felt like it changed my life! I appreciated your personal story in the book as well. Finally the word is getting out! Just make sure you eat grass-fed butter and beef. More expensive yes, but it’s healthier. I have been listening to “Grain Brain” and plan on using the information to improve the way I eat. My father has Alzheimer’s and I have seen what this disease can do. This is all good news! Thank you Dr. Northrop for sharing this most important information!! Carole, I am with you. NO gallbladder means we have trouble with fats. I go to weekly acupuncture to help me with this and I take Chinese herbal medication that helps for people with no gall bladder (they work on the liver and spleen) but I am interested in this too? I am a full time caregiver of an 89 year old dementia patient. Her family was told she had Alzheimer. I put her on the Dr. Perl-mutter diet and just like he said Her Mind cleared and her ability to walk improved. if its NOT THE FOOD then what?? This is the answer for me. Thank you Dr. Northrup for spreading the great news! I agree and also all the research on eating Coconut Oil to stop and reverse Alzhemiers and other brain disorders. My mother died of Alzhemiers and I watched the standard medical care and the dementia living facilities where she stayed and their lack of quality fats and fresh foods. A great breakfast option is chia pudding w coconut milk…add in some walnuts or almonds and a few blueberries…delicious! Thank you for this article. My father had Alzheimer’s disease, such a horrific life-robbing condition–and the cost of his care was astronomical. I am so grateful that this information is becoming a mainstream conversation. I agree 1000% that healthy fats are good for the brain. I notice a significant brain boost when I take spirulina. My thinking is clearer, and I have better focus and concentration. You just have to be diligent about taking the daily recommended dosage every day. Sublingual B12 is also very helpful. It seems like there are a lot of good brain boosting supplements out there, which is hopeful, and good for folks who find it hard to adhere to a stricter diet. Great article. Thanks for posting! Coconut oil is just as protective as butter, possibly more so because it is 60% ketones, and with coconut oil, one doesn’t have to get into the cruel situation of the dairy industry…what do you think happens to all of those male calfs? veal…”so what, you say”…have you ever investigated the veal industry? might be a good ideal. It’s a terribly cruel way to live and die. I tried the higher fat-low carb diet one week before my gall bladder and ulcer objected. I’m not sure this diet is possible to follow for those of us with these problems. Dr Northrup, thanks for reassuring us that good fats, such as butter, are ok. It’s sad that the majority of people still believe low fat diets are better, despite the ongoing health problems they experience when eating high carb, sugary, low fat diets. There’s more and more research showing that good high fat, good protein and low carb diets actually reverse cholesterol problems and things like diabetes. Keep up the good work so that more people can be informed! I have pre-diabetes that I control with a low carb.,sugar diet. I am 70 years old. If the information I found online is true about 1/2 the American population over 65 does not have to limit their carbs and sugars to keep their blood sugar in check. What about these people; can they really eat as much as they want of anything they want with out health consequences? And can a person with diabetes1 eat anything they want as long as they shoot up enough insulin to cover it?. My holistic M.D. and chiropractor told me that butter was good back in the 1980s and 1990s and even said that it has anti carcinogenic properties. When I was getting myself off of an overdose of blood thinners, Kate’s unsalted butter heated with raw milk was all that my body could tolerate. I could feel the healing power of the raw milk and the butter. I seem to need grains for healthy digestion. I think the egg eating and cholesterol relationship was debunked a long time ago but it is still in our brains that eggs causes high cholesterol.. not true.. right Dr Northrup? and yes i have read the Grain Brain and have cut WAY back on all grain and sugar (already have been gluten free for 5 years) and my health is SO MUCH better! What about people with high cholesterol, who can’t eat a lot of eggs? What are we supposed to eat for breakfast, other than yogurt? And what are people on Coumadin supposed to do? They can’t eat a lot of greens. Thanks for any advice. It really helps to know the delivery system of sugar and fat combined…I have ALWAYS had butter and I’ll make sure it’s organic…butter makes me happy like a chocolate!! what about people with gall bladder problems who cannot easily digest fat? FINALLY this info is getting out. STILL see egg white omelets etc being promoted. Now if they will just get non-factory produced eggs from truly free range chickens.